French Union Protests Make a Good Start Against Macron’s Labour ‘reforms’. Protests took place yesterday in cities across France against changes to the country’s labour laws. Libération today carries extensive reports on the 12th of September day of action against the new wave of labour code ‘reforms’, which will weaken workers’ bargaining ability and rights, including their compensation from Employment Tribunals. (Loi travail : de Lille à Marseille en passant par Grenoble, la rue gronde). 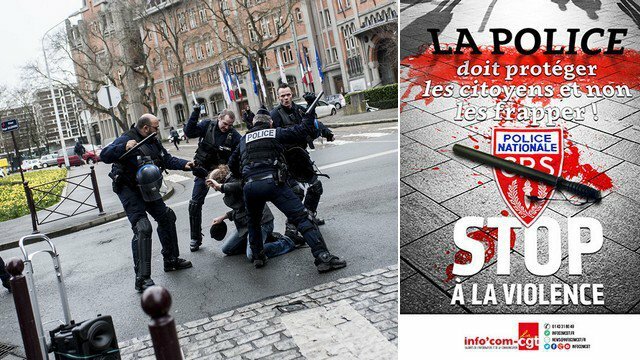 Le Monde notes that at 5000,00 people across France (230,000 according to the police) the level of people taking part was nearly at the same level as those against the previous Labour ‘reform’, the El Khomri law – despite the fact that this time around two union federations, the CFDT and FO did not take nationally take part. There were some welcome local exceptions of total union unity (Front syndical uni : des manifestations rares, mais qui mobilisent). The first anti-El Khomri marches on the 9th of March 2016 gathered 450 000 et 500 000 ( 224 000 police figures). The left daily, l’Humanité, called it a promising springboard for future action (400 000 contre la loi travail XXL, un beau tremplin pour la suite). On the 23rd of September Mélenchon’s rally, La France insoumise has organised its own event, the “marche contre le coup d’Etat social”. This has been criticised, some noting Mélenchon’s claim to be effecting the “replacement” ( remplacement) of both the Parti Socialiste and the rest of the left, and, some accuse him, trade unions, by his own movement. The CGT and the Parti communiste français (PCF) are participating in Peace marches on that day (Le Mouvement pour la Paix appelle à une grande journée de mobilisation partout en France le 23 septembre). The CGT has its own next moblisation on the 21st of September (Journée d’actions, de mobilisations et de grèves). This is the report in France 24. Tens of thousands of hard-left trade unionists marched through French cities on Tuesday to protest against President Emmanuel Macron’s labour law reforms, although turnout appeared lower than at demonstrations in previous years. France 24 puts this story under the headline, no doubt for the benefit of its transatlantic readership under the heading, “Hardliners protest French labour reform as Macron chides ‘slackers’. The word used against workers was ” fainéant”, literally, “do-nothings”. The Paris prefecture said 24,000 protesters turned out in the capital, where riot police clashed with hooded youths in isolated skirmishes on the fringe of the march led by the Communist Party-linked CGT union. That was under the 28,000 estimated by police during March 2016’s demonstration. Labour unions have scuppered previous attempts to weaken France’s labour code, but this time there was comfort for Macron as two other unions, including the largest, the CFDT, declined to join the protests. “We’ve been passing laws which take apart the labour code for 20 years. The answer (to unemployment) doesn’t lie in rolling it back further,” said Maxime Durand, a train driver on strike. After weeks of negotiation, the government last month set out measures including a cap on payouts for dismissals judged unfair and greater freedom for companies to hire and fire. The reform makes no direct reference to the 35-hour week, a totem of the labour code, though it hands firms more flexibility to set pay and working conditions. The government plans to adopt the new measures, being implemented by decree, on Sept. 22. He said the “slackers” comment was aimed at those who had failed to push through reforms in the past, although political opponents and some unions took it as an attack on the unemployed or on workers making the most of job protection. “We will make Macron back down,” far-left firebrand Jean-Luc Melenchon, who has become Macron’s most vocal opponent in parliament, said on the sidelines of a protest in Marseille. French workers have long cherished the rights enshrined in the labour code, but companies complain it has deterred investment and job creation and stymied economic growth. Unemployment has been above 9 percent for nearly a decade. Macron’s reforms are being followed in Germany as a test of his resolve to reshape the euro zone’s second-biggest economy, a must if he is to win Berlin’s backing for broader reforms to the currency union. The CGT is France’s second-biggest union, though its influence has been waning. Its leader Philippe Martinez said Tuesday’s nationwide protests were the “first phase” and more would follow. He called Macron’s reference to “slackers” an insult to workers. “The president should listen to the people, understand them, rather than cause divisions,” Martinez told France 2 television. CGT workers from the rail, oil and power sectors heeded the strike call but by the afternoon there was no apparent impact on power and refining production, spokespeople for utility EDF and oil major Total said. Just over 11 percent of the workforce at EDF, which operates France’s fleet of 48 nuclear reactors, took part in the strike, a spokeswoman for the state-owned utility said. Macron: a Good for Nothing is Worth Two of You Mate! Lazy-bones of the World Unite! Here: Lazy. Cynical and Extreme! Too idle to Find a Slogan! Death of Georges Séguy, Resistant, Leader of the CGT, and Communist. Georges Séguy: From the Resistance, Manthausen Camp, to May 68. Georges Séguy who led the CGT, the largest French trade union federation, close to the French Communist Party, from 1967 to 1982, died on Saturday at the age of 89 years at the hospital Montargis (Loiret). He passed away early yesterday afternoon,” said Elyane Bressol, President the Institute of social history (IHS) of the CGT, which Georges Seguy was honorary president. He was hospitalised for several days to Montargis Hospital, in Loiret. More dignified tributes in the pages of l’Humanité. Le Monde: Georges Séguy, ancien secrétaire général de la CGT, est mort. Libération: Georges Séguy, la CGT perd un patron. As an apprentice printer, a member of the young Communists, and part of the resistance group Francs-tireurs et partisans français (FTPF) Séguy was arrested at the age of 17 by the Gestapo and deported to Mauthausen. France 24 outlines Séguy’s trade union career. His health affected by the deportation he became an electrician and worked for the French national rail service, the SNCF. He was both active in the French Communist Party (Parti communiste français, PCF) and the CGT (Confédération générale du travail). Georges Séguy devient en 1961 secrétaire général de la fédération des cheminots, l’une des plus importantes avec celles de la métallurgie et de l’EGF (électricité et gaz). Entré en 1965 au bureau confédéral de la CGT, il succède en 1967 à Benoît Frachon au poste de secrétaire général. Il vient de fêter son quarantième anniversaire. Georges Séguy became General Secretary of the train-drivers and rail-workers’ federation, one of the most important wings of the CGT union federation, along with the engineers (roughly in the sense used by the Amalgamated Engineering and Electrical Union AEEU), and the Gaz and Electricity producers. AFter becoming part of the national committee of the CGT in 1967 he took over from Benoît Frachon the post of General Secretary. He had only just celebrated his 40th birthday. Un an plus tard, ce sont les événements de mai 68, les barricades, neuf millions d’ouvriers en grève, la révolte étudiante, De Gaulle ébranlé. Lors des difficiles négociations de Grenelle, Georges Séguy, au nom de la CGT, affronte Georges Pompidou, Premier ministre. One year later and the May 68 ‘events’ took place, barricades, 9 million workers on strike, the student revolt, leaving President De Gaulle completely shaken. During the difficult negotiations with the gvoernment that took place at Rue Grenelle, Georges Séguy confronted the Prime Minister Georges Pompidou. Sous les présidences de Georges Pompidou et de Valéry Giscard d’Estaing, la CGT, alors au faîte de sa puissance, mènera sous sa houlette une lutte permanente contre la politique contractuelle lancée au début des années 1970 par Jacques Delors, alors conseiller social du Premier ministre Jacques Chaban-Delmas. Under the Presidencies of Georges Pompidou and Valéry Giscard d’Estaing the CGT, at the height of its power, waged a permanent war against labour reforms (part of the ‘nouvelle société’ project which drew Delors, from a left Christian democratic tradition into the right-wing government’s orbit) launched by Jacques Delors, at the time a top adviser on social affairs to the Prime Minister Jacques Chaban-Delmas. In 1968 Georges Séguy was central to the Grenelle Agreements which negotiated an end to official union backing for the strikes in return for substantial government concessions of workers pay and rights. The Grenelle Agreements, concluded 27 May 1968—but not signed—led to a 35% increase in the minimum wage (salaire minimum interprofessionnel garanti) and 10% increase in average real wages. It also provided for the establishment of the trade union section of business (Section syndicale d’entreprise), through the act of 27 December 1968. Georges Séguy and the CGT’s role in May 68 remains a matter of great controversy on the French left, if not internationally. There are those who would dismiss the Grenelle accords, others would personally attack Séguy. There are serious critical points to be made, above all by French leftists and trade unionists. By contrast, it is to be expected that a section of the British left, notably the Socialist Workers Party and the Socialist Party in England and Wales, will savage comrade Séguy. Some will note the irony of those who have recently been cheer-leaders for the reactionary nationalist Brexit campaign attacking a leader of a mass trade union who obtained substantial concessions from the French government in 1968 for ‘reformism’. In Séguy’s own account of the events of May 68 he states, that, while freely admitting that his union and party had been overtaken by events, and that a gulf between the students and the CGT had opened up (noting in passing that their anti-Stalinism was, for him, identical to anti-Marxism and anti-Communism) , the CGT and the unions had still achieved a major step forward in terms of social reform within the world of work. Some obituaries have noted that Séguy tried to democratise the CGT during the late 1970s, and to return it to independent spirit of the Charte d’Amien (1906) a struggle which led to his eventual resignation as General Secretary (1982). Quel bilan faites-vous des avancées sociales issues des négociations de Grenelle? Elles ont été supérieures à celles de 1936! Avec 8 ou 9 millions de grévistes, la pression sur le gouvernement et le patronat était telle que le pouvoir a dû faire des concessions importantes. Ainsi, nous réclamions un salaire minimum à 600 francs par mois, soit une augmentation de 37%: cette revendication, qui avait toujours été repoussée, a été résolue dans les dix premières minutes des négociations de Grenelle! En dehors des augmentations de salaire, nous avons principalement obtenu la liberté des activités syndicales dans les entreprises et la réduction du temps de travail, avec le retour de la semaine de travail de 40 heurs. The social advances were greater than those of 1936. With 8 to 9 million strikes the pressure on the government and the employer was such that they had to make important concessions. The minimum wage of 600 francs a month, a rise of 37%, a demand which had always been turned down, was accepted within the first ten minutes of the negotiations! Apart from wage rises we gained the freedom to organise unions in all enterprises, and a reduction in working time, back to 40 hours a week. These are other interesting observations. The ex-General Secretary of the CGT retorts to the right-wing candidate’s speech about May 1968 (1). Huma: What was your spur-of-the-moment reaction? Georges Séguy: It gave me a start. I understand that the events of May 1968 left the reactionaries and especially the employers, with painful memories. But it’s the first time I’ve heard a politician like Nicolas Sarkozy condemn a memorable moment in our national social history in such retrograde terms. The main historical importance of May 1968, is neither the police violence in the Latin quarter, nor the legitimate controversies of different philosophical currents of the time, it is the general strike of ten million workers who took over their companies. Huma: Not everyone remembers the outcome. Can you remind us what it was? Georges Séguy: The workers were infuriated by years of governmental and employers’ opposition to any social progress. The general strike had one aim: to overcome this blockage, to obtain the opening of negotiation procedures. A huge majority of factories which had been occupied by their workers, many for the first time, signed the commitment of 25th May 1968 at the Ministry of Employment, boulevard Grenelle. It didn’t take long. Within a few hours, many demands, which it would take too long to list, were taken into account. The most extraordinary of which was a 30% raise of the minimum wage. When you see all the commotion about the minimum wage at 1500 euros, gross or net, it is worth remembering that this raise in the minimum wage and low salaries in the provinces, in Brittany for example, boosted domestic consumption to such a point that economic growth was increased more than at any other time during the period known as the “Trente Glorieuses”. Huma: But you are talking about the workers, and of their strikes, and it is precisely this aspect that Nicolas Sarkozy did not talk about. Is there some misunderstanding? Georges Séguy: No. Sarkozy knew exactly what he was doing. He censored the workers strike in his speech because it contradicts his attack on May 1968. He cannot proclaim his love for the workers and at the same time revile them when they accomplish a leap forward in their conditions and in society. The worker he respects is the one who gets up early and works flat out for his boss, even if the same boss might sack him one day. It’s not the one who stays up late preparing action that will help others defend their interests and have better lives. His slogan “work more to earn more” is misleading. To earn more, you have to fight more. I challenge anyone to look back at history and prove the contrary. Huma: What was the point of this diatribe? Georges Séguy: This malevolent condemnation, comparing militants, trade unionists and dissatisfied workers to hooligans, aims to discredit a movement where the famous work value that Sarkozy brandishes won a spectacular victory over those whose only thought is of over exploiting it to their advantage. The scale of this movement remains and will remain, at a much higher level than a politician’s ambitions, one of the most significant examples of French workers’ attachment to the social model resulting from the National Council of the Résistance. Huma: Nicolas Sarkozy has no qualms about referring to the Résistance himself, from Général de Gaulle to Jean Moulin, to Guy Môquet. What is your reaction to that, as a résistant who was deported at a very young age? Georges Séguy: He certainly had the gall to quote such glorious names. But it’s precisely the great social conquests imposed by the Résistance that he wants to destroy: a social security system based on solidarity between generations, a right to retirement, freedom of action for trade unions, nationalisations, large public services etc. His programme is the opposite to that of the National Council of the Résistance. In subjecting the historical social progress of May 1968, to public obloquy, and at the same time drumming out his love for workers, Sarkozy shows that, if he is elected, the French social model will not outlive his all-consuming fervour for work. Georges Séguy: As I see it, in what the UMP leader is saying, his overall attitude towards May 1968 is of great importance. Apart from the leftist diversions of a few groups, May 1968 was also a wonderful young people’s revolt against the advocates of the doctrinaire approach and totalitarian-minded political powers which had a tendency to stiffen the democracy. This brought about a huge juvenile movement towards a society freed of old fashioned mentalities, of unfairness and of the shackles of all sorts of bans and taboos. We were spectators to a strong push for social, political, and cultural emancipation. For women, that meant rejection of inequality and discrimination, the new force of feminism was women’s rights. In short, May 1968 was a great social movement and an extraordinary request for morals, habits, and society to be modernised. I am a witness to the fact that the workers movement did not necessarily realise that at the time. By proclaiming his loathing for this call for emancipation, Nicolas Sarkozy shows us whose side he is on: on the side of the big bosses, of an out-of-date monarchial system. French Conflict over ‘Loi Travail’ Intensifies as Nuclear Workers join Protests. In Reply: CGT Trade Unionists Face Violence Smears. France prepares for day of strikes as nuclear workers join labour protests. France faced an eighth day of industrial action on Thursday after workers at nuclear power stations voted to join protests against labour reforms. Blockades of fuel depots by angry unions have forced France to dip into its fuel reserves. CGT energy and mining federation spokeswoman Marie-Claire Cailletaud said the strike action at nuclear plants will reduce power output, but that the reactors will not stop running. “One cannot just turn off a nuclear plant, it is not like a thermal or hydro plant,” Cailletaud said. The union said late Wednesday that 16 of France’s 19 nuclear stations had voted to join the strike, although CGT official Jean-Luc Daganaud said the effect on power supply would depend on how many workers decided to join the action. Workers led by the powerful CGT union have blocked oil refineries across France over the past week in protest against planned changes to France’s cherished protective labour laws, leading to fuel shortages in parts of the country and long queues of cars at near-empty petrol stations. The Ufip oil industry federation has confirmed that around a third of the country’s 12,000 petrol stations were running dry. France has also mobilised its emergency fuel stocks for the first time since 2010 but officials said there was no risk of a shortage. It is the case that the CGT faces a challenge from the ‘reformist’ union federation, the Confédération française démocratique du travail (CFDT). This morning on France Inter Véronique Descacq, secrétaire générale adjointe to the CFDT, claimed to have negotiated a deal which they can live with. She asserted that the reform embodies new workers’ rights (listen here). 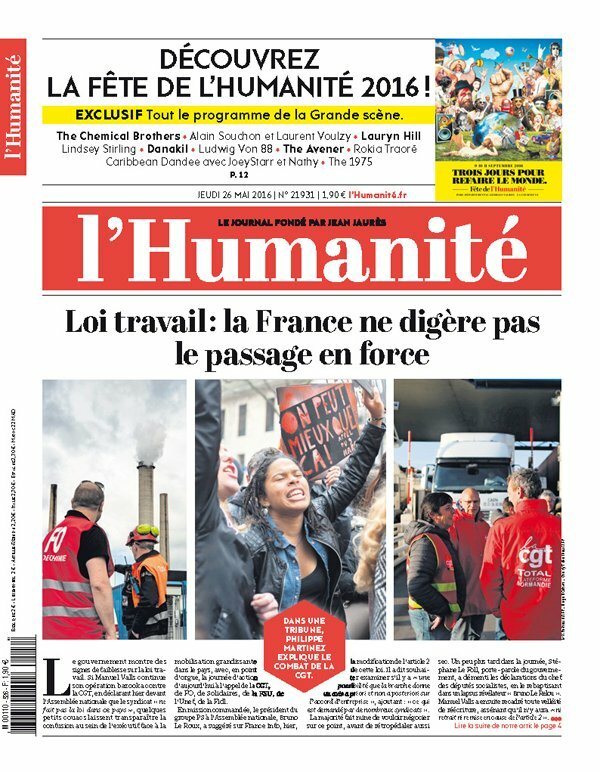 Against this claim – essentially that the CGT is acting purely out of its own interests – L’Humanité has pointed to the unity between the trade unionists (with the CFDT excepted), from the corporatist and (partly) Trotskyist federation, Force Ouvrière , to the radical left SUD in protests and strikes against the Loi Travail (Une grande partie du personnel qui attendait l’unité syndicale va se mettre en grève). What is at stake is not only moves to make working practices more ‘flexible’ to the bosses’ advantage. It is the shape of French collective bargaining (covering up to 98% of employees). The ‘reforms’ weaken them allowing local accords and which give employers the ability to go over the heads of unions by enterprise by enterprise referendums. The CFDT is equally acting in its own interests, with, it claims, strength in the these direct company negotiations it can by-pass the CGT which prefers to reach agreements by “branche”, that is by sector. It would not, by contrast, be unfair to point out the CGT is using the industrial strength that it has – in the sectors cited in the France 24 report. 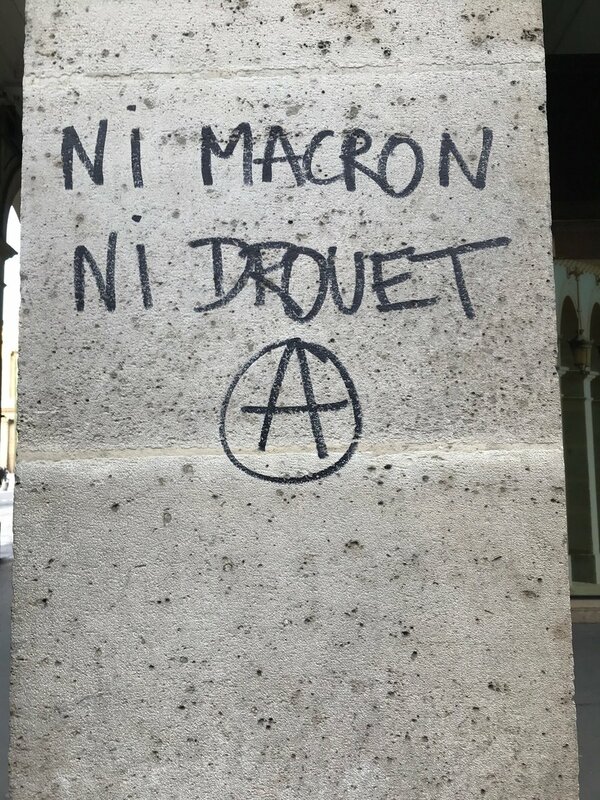 (Loi Travail : pourquoi la CGT durcit le mouvement). Why should it not do so? As the conflict intensifies there is a concerted attempt to link the CGT not only with claims of intimidation against non-strikers, but also with acts of violence against its opponents which Descacq echoed. Those in the Parti Socialiste who have backed the ‘reform’ – despite opposition within their own ranks – have, it is claimed, been singled out. 31 of the Governing Parti Socialiste’s offices across the country have, since December, been the target of acts of vandalism. These have mostly been minor but on Monday their Grenoble HQ was sprayed with 12 bullet shots (le Monde). It would be extremely rash to offer any kind of judgement about the probable outcome of this conflict. Update: The leader of the CFDT has just declared that it would be “unacceptable” to drop the ‘reform’ as that would mean losing the “new rights” which it offers.